Details relating to the German Commemorative of 2018. This coin, the thirteenth in the series of German provinces, represents Berlin. Berlin is one of three “city provinces“in Germany -i.e. cities that have the status of provinces. The other two are Hamburg and Bremen. 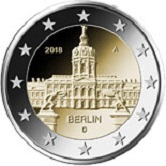 The motif is the famous Berlin landmark, the Charlottenburg Palace and is shown on the coin as it is seen from the street. On top of the dome is a statue of the goddess Fortuna. This replaces the original that was destroyed in the war. Between seven and eight o’clock and between four and five o’clock are two statues on the entrance pillars, the left representing a sword and the right a shield. In the upper quarter of the inner circle, the year of issue 2018 appears on the left and the mint mark on the right. At the bottom just above six o’clock is “BERLIN” and directly thereunder the country designation “D”. The mark of the designeris seen on the left entrance pillar. Return from German Commemorative 2018 to euro coin collector.